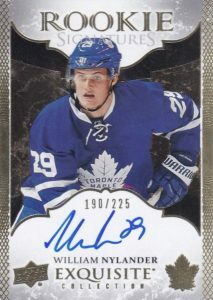 Slightly dropping the total cards per box from 2015-16, collectors can find one hard-signed autograph in every 2016-17 Upper Deck Ice Hockey box along with one relic or Exquisite insert and two Ice Premieres rookie cards. Kicking things off is the 100-card base set with acetate stock. 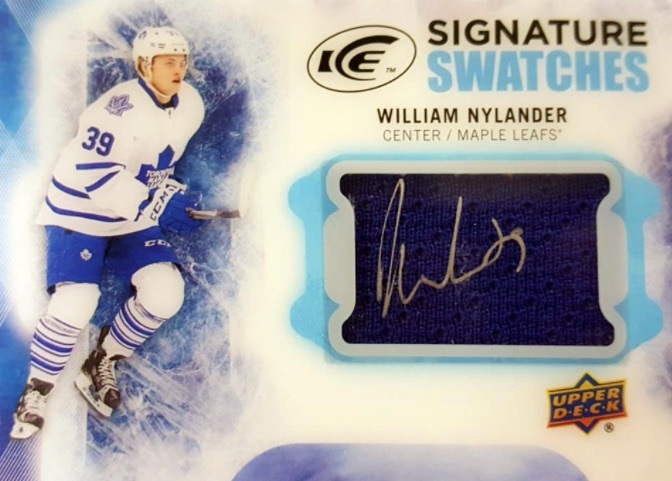 An annual favorite for hockey fans, the limited and valuable Ice Premieres average two per box with multiple versions for top rookies: Level 5 - #/1299, Level 4 - #/999, Level 3 - #/499, Level 2 - #/249, and Level 1 - #/99. Taking that a step further are Ice Premieres Autographs (#'d from to 299 to 25 copies) and Ice Premieres Autographed Patches (#/10). 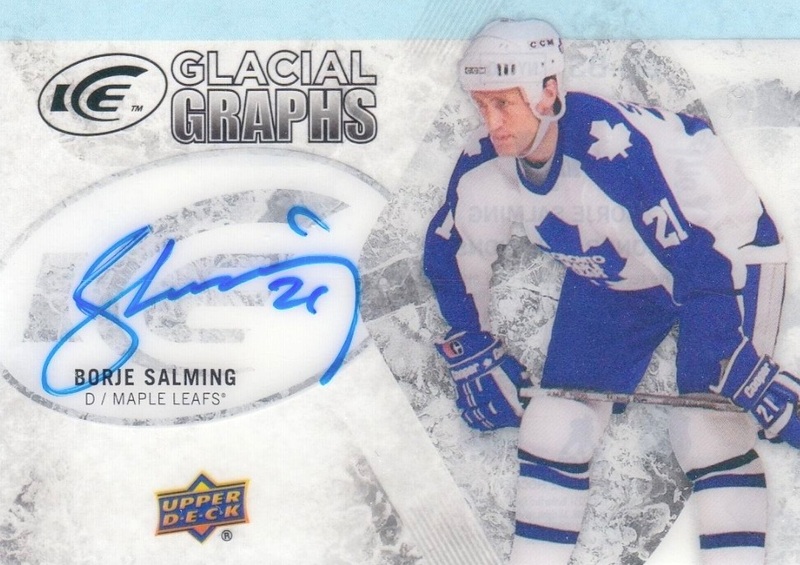 2016-17 Upper Deck Ice Hockey also includes autograph cards for current and former players with Glacial Graphs (1:45 packs), Rinkside Signings (1:56 packs), Signature Swatches (1:70 packs) and Superb Script (#/49 or #/25). As far as the other hits, memorabilia inserts come in four different themes, and each has a limited Red parallel. Among these are Fresh Threads (1:20 packs), Frozen Fabrics (1:35 packs), Rookie Relic Jumbos (#/199) and the four-player Frozen Foursomes (1:151 packs) inserts. 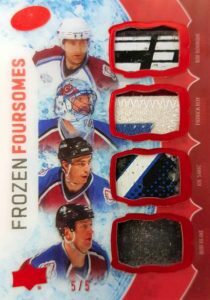 Adding more quality inserts to 2016-17 Upper Deck Ice Hockey, Sub Zero (1:4 packs) is a new option that showcases a holographic acetate design. Returning to the hobby, Ice Champions drops at a rate of 1:80 packs and features a die-cut look. 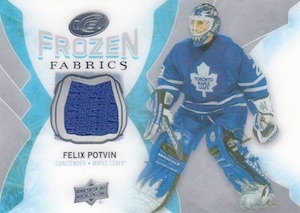 Additional inserts include World Juniors, found in Level 2 or Level 1 versions (#/699 or #/299). 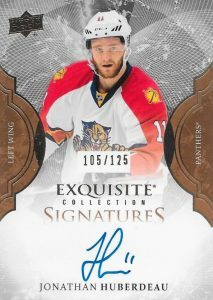 Offering the second round of 2016-17 Exquisite Collection cards, 2016-17 Upper Deck Ice Hockey is also the place to find Exquisite Legends (#/99) and Exquisite Rookies (#/299 or #/199) base cards. Autographs include Exquisite Rookie Signatures (#/225 or #/125), Exquisite Material Signatures (#'d), and Exquisite Auto Tribute Rookies (#/25). 2016-17 Upper Deck Ice Rinkside Signings Autograph Auto #RS-DS Derek Stepan !! 100 cards. Shop complete sets on eBay. Die-Cut parallels are an unannounced addition. 37 cards. Serial numbered #/10. Shop on eBay. Overall Odds - 1:20 packs. Specific group odds noted below. PARALLEL CARDS: Red Patch #/25. Overall Odds - 1:35 packs. Specific group odds noted below. Overall Odds - 1:151 packs. Specific group odds noted below. Overall Odds - 1:45 packs. Specific group odds noted below. 36 cards. Many cards have inscriptions noted below. 24 cards. 1:80 packs. Shop on eBay. Overall Odds - 1:56 packs. Specific group odds noted below. PARALLEL CARDS: Red Patch #/15. Overall Odds - 1:70 packs. Specific group odds noted below. Overall Odds - 1:4 packs.Veterans - 1:6 packs, Rookies - 1:10 packs. 5 cards. 1:288 packs. Shop on eBay. These unannounced inserts have different images. Specific SSP group odds noted below. 20 cards. Specific pack odds and/or print runs noted below. Shop for available 2016-17 Exquisite Hockey cards on eBay. Shame on you UD for dropping this down to 6 packs from 8! Use the excuse of lower box price all you want but we all know, in the end, that the price will be pretty much the same to other years. The only difference? Less value and less cards. I love Ice but I will not support UD any longer. You won’t see any more of my money. At least the /1999 rookies have been removed but they probably could have knocked off the /1299 as well. I wish UD would think value instead of quantity but what do I know? Everything is moving to digital so how long before UD moves Ice, SPA, etc.. to ePack? A year? 2 maybe? 1. In a box you get 24 cards instead of 32. 2. The price per box will most probably remain the same, around 110$. 3. Both offer at least 6 inserts. 5. This yeas 1 Memorabilia or 1 Exquisite inset, while last year 1 Memorabilia and 1 Exquisite inset. This year they added instead a Sub Zero inert. 5. The huge difference is the Ice Premiers. Now, last year the checklist said it offered 3 Ice Premiers, which did not necessarily mean Ice Premier Rookies. It could have meant Ice Premiers Rookies Retro. 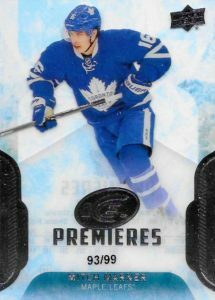 This year there’s no Retro, so you are guaranteed 2 Ice Premiers Rookies and you may perhaps get another one because there’s another insert guaranteed amongst Ice Champions, Ice Premieres or World Juniors Insert. So basically, I believe in the end, you’ll get almost the same number of Ice Premiers Rookies per box. But, compared to the last year there’s a huge difference concerning the total number of Ice Premiers Rookies. Last year there was a total of 132,900, while this year there are only 87,900 because they have eliminated the #/1,999 and the #/1,499 cards and they only started the serial numbers from 1,299 onto. In the end there are much more chances to hit a big hit this year than the last one. From experience, I always pulled 1 Level 1 per case and much more than the guaranteed number of rookies per total. Besides, Ice is my favourite product because of the design and the hard autos. I will not give stars right away because I want to open it first, but it looks promising. That’s not the real price Jimmy. It’ll be something like 90 US or 120CAD. The 114USD is the price of the cheapest box they found on eBay.com, in presale. Thanks for the update TCB but still an outrageous price point (over $20 a pack) for 24 cards and 75% are base. Good luck on your breaks, sadly I will have to pass for the first time on ice. What’s next year gonna be, 12 cards total and 4 packs but only 90 CND? Up to now, this is a total disaster. After I opened 2 case, I have no rookie level 1. The last 2 years I always had 1 Level 1 per case. This year, I have 2 Level 2!!! Are you for real UD??!! The best you can do is 1 Level 2 per case and 4 level 3 per case??!! I am so disappointed I don’t even know if I will open the 3rd case…I may return it. I will see if it was just me who got very very unlucky or this is the average with Ice this year. 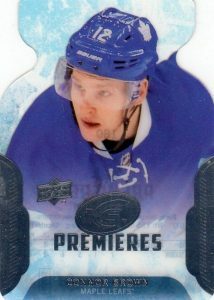 Just found a die-cut ice premiere of a rookie and are they supposed to be numbered like the base rookie. First box had no exquisite card in it. Correct me if my math is wrong, but 6 packs of 4 cards= 24 cards. 120 a box divide by 24 cards = 5$ a card. It what world is a base card worth $5. Seems like a tough break to me to break even. Would stay away. Yes, Jerry, you’re right, 5$/cards in average. That’s an excellent way to see the real value of a specific collection. They change the format so often that the price per box/case doesn’t tell much anymore. The best way is to see what’s the average price per card. Alan, the die-cuts are not serial numbered. In terms of odds now, I have no idea what they are. Perhaps they go with the level of the rookie, the lower the level, the lower are the chances to hit one. 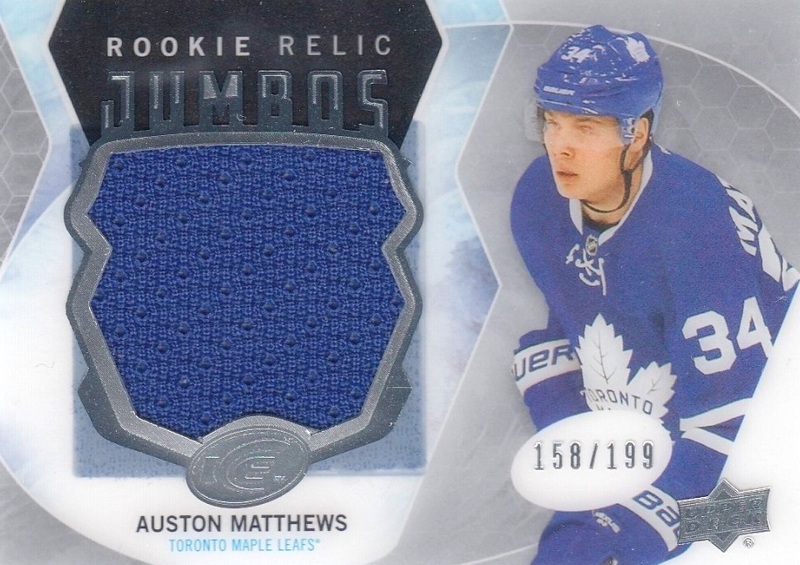 Hit a Sub Zero Auston Matthews short print rookie SZ-100. Not on the checklist. Just letting you guys know. Opened 3 boxes yesterday. What a mistake. Total piece of crap product. Upper Deck screwed this up royally. When you open 3 boxes at this cost, and your best auto is Noah Hanifan (no offense to him), that is a joke. In all, I got 3 autos (all veterans) and two jersey’s. Didn’t even get what I was supposed to get. Two rookie premieres per box and all but one were commons numbered to 1299. The other one was a common numbered to 999. I’m a big time collector and ice is one of my favorite products but I have to agree with everybody just not worth it. like tcb I opened a case yesterday and no #d to 99. that’s not right. based on what I got I couldn’t tell you what was my case hit. 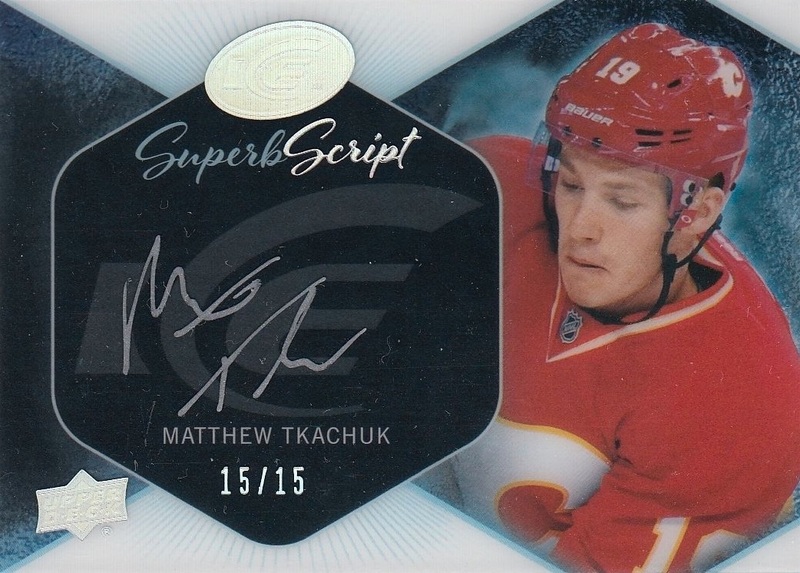 worst thing they put in the product is last years ice rookie autos who cares. got two of those. do you think mcdavid auto is in there. TCB…did you open 2 master cases or 2 inners? Ditto on all of the above comments. Opened a 10-box inner case and no cards I would be proud to own. Sure, I got a few exquisite autos of 3rd tier rookies but I can buy those on ebay for $5 all day long. I used to love UD but break value is getting worse and worse every year. Love how UD advertises their “random acts of kindness” on social media and thinks nothing of the people who break their products. I have a question…and if I missed it above I’m sorry. 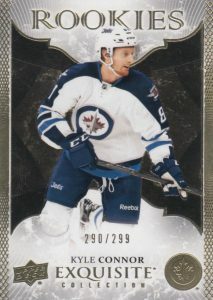 Is there a parallel set with blank fronts (no foil stamping where it should be so there’s no Upper Deck logo, Ice logo, player name or silver stripe along the bottom of the boomerang of the card)?? I broke a box earlier today and pulled a Vincent Trocheck #58 base card that matches this description. Anyone else come across this? Error card (oh no…the early 90’s have returned!!) or short print parallel? I dont’t think that’s a parallel, but a misprint. 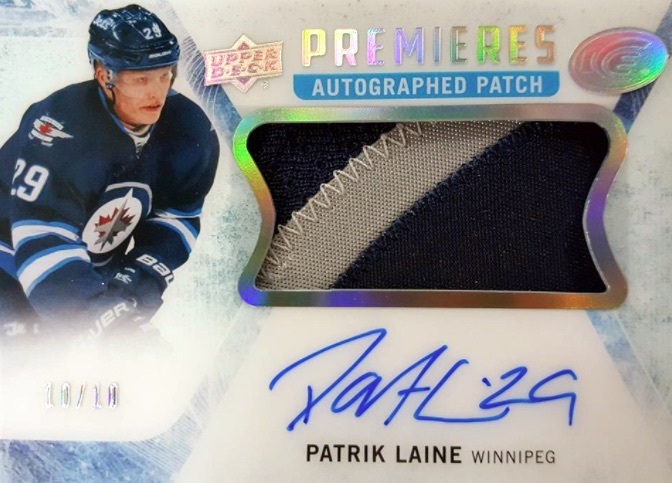 Well mate, you did good :) The Laine Auto Swatch sells for around 150 CAD. 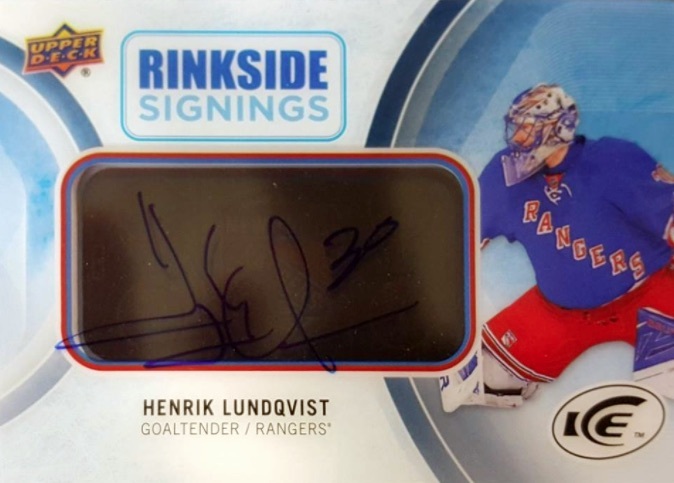 After Panini managed it last year, Upper Deck is also really working hard to come on my personal Black List! This product is an utter joke as the value is so watered done by all the scrub rookies (why even numbering a card to 1299?) and ‘no name’ veteran cards, that secondary value almost doesn’t exist! Only the very few #99 and #10 Patch cards of the top rookies and a very few Exquisites hold some value, good luck to hit one of these as odds are completely insane! This is just yet a another group breakers only product and if you’re not completely insane, stay away from personal breaks of UD Ice!!! No Crosby or Gretzky auto? This is a group break product. As long as you aren’t chasing Winnipeg or Toronto, you should, on average, do okay based on what you are spending. Speaking from experience, I like to buy into Florida. I have been shut out a few times but I have also won some nice stuff (like a Jagr sig swatches). Dallas, Tampa and Philly/NYI/NYR for a little more have generally shown well. If you are going for one of the big boys, try team random. As for personal breaks, avoid like the plague. The overall value just isn’t there unless you nail down one of those /99 RC’s or a low #’d auto parallel.